US-China Today: Opinion: Grappling With China's Diversity Issue . Joseph Saraceno shares data that shows differing social values between generations in China. 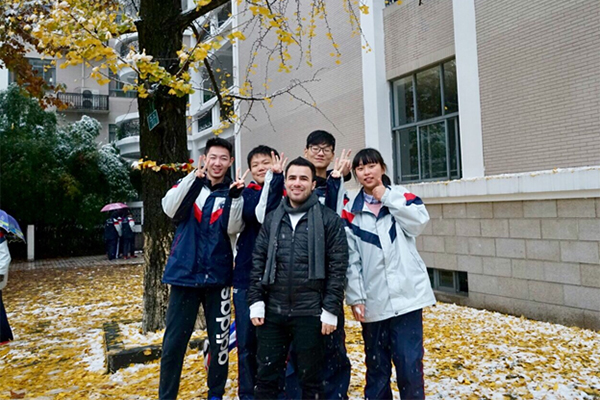 Upon arriving in Nanjing last year, I was tasked with completing a “foreign teacher training” in which aspiring educators learned the do’s and don'ts of working in China. In our first session a Ministry of Education emissary sternly warned our cohort that matters involving sensitive social issues — abortion, gay rights, religion — were prohibited from classroom discussion. He suggested that they were to be left strictly between parents and their children because of their intimate nature. Around the same time, the 2017 Social Progress Imperative released their annual evaluation of comfort levels experienced by social minorities. China ranked 142 out of 177, underscoring the unfortunate conventional wisdom that it is not the most open, tolerant or accepting place for diversity. I received an emotional email from a female student in my second week on the job. She described in vivid detail how she was taunted in middle school for her interest in reading gay romance novels. Her classmates reviled her as “deviant and disgusting” and when word spread to her parents, they were alarmed and “…contacted the story’s writers and illustrators with insulting words and asked them why they wrote or drew these things to lead kids astray.” However, upon entering high school, it appeared as though attitudes on the subject had changed. She wrote that she had encountered others who were open-minded and accepting of many historically stigmatized behaviors. Because I taught social sciences and humanities in a university setting, issues regarding race, gender and class naturally arose. It was in these moments when I noticed a profound interest from part of my class. Students would stop me to ask for an explanation on how religion could be such a big deal in American politics or why structural injustices remain so blatant and pervasive to this day. At many times it even suggested a desire to put forth alternatives to commonly accepted ways of doing things. It was in this spirit that I set out to see if the transmission of social values between parents and their children in China may not be as firm as we think. To this end, I conducted a survey of nearly 200 high school students in which they were presented with a statement and tasked to indicate their preference on a five-tiered scale (strongly agree, somewhat agree, neutrality, somewhat disagree and strongly disagree). They were then instructed to answer the same statement according to what they thought their parents would answer if posed. To illustrate, the students would be posed with something to the effect of: “I would feel uncomfortable if my college roommate was Muslim.” Following this, they would dictate the level of agreement for 1) themselves, and 2) what they thought their parents would write. The hope was to draw some rough conclusions based on the differences between the student and “parental” opinions. It should be noted that, while I was given permission to conduct the survey as part of a university-sanctioned project, that permission did not extend to the direct inquiry of parents. My guess is that speaking to parents directly would have brought unnecessary attention, given the subject matter. As such, one shortcoming of the survey is that the student’s impressions of their parent’s personal feelings are not necessarily accurate. That being said, students were given the option of declining an answer if they had no indication of their parent’s opinion on a given issue. One of the most interesting findings revolved around openness to interracial relationships. Historically, the number of relationships involving Chinese and other nationalities has been remarkably low — although it has been steadily increasing in recent decades. According to Elaine Jeffreys and Wang Pan, authors of “The rise of Chinese-foreign marriage in mainland China, 1979–2010,” the number of interracial marriages in China grew from 300 in 1979 to its peak at 26,000 in 2001. Even at its apex, however, interracial marriages represented but a small fraction (.00325) of the 8 million total marriages in that year. As it turned out, both parents and students seemed relatively open to interracial relationships. On the five-tiered scale (1 being strongly approve and 5 being strongly disapprove), the average parental score was 2.60 while the students were roughly 38% more approving at 1.61. This seems to suggest that this younger generation may be less preoccupied with ethnic homogeneity than previous ones. When asked, my students reported that the increasing prevalence of foreigners and exposure to international media has made interracial relationships more feasible and less extraordinary. Another interesting finding suggests that attitudes towards the LGBT community might be notably warmer in youth than in their parents. This would be a welcome change, especially considering a 2016 Peking University survey statistic which found that only 5% of Chinese LGBT+ openly identified as being homosexual. Moreover, any examination of social trends would elucidate a longstanding social ambivalence towards homosexuality in China. Some well-explored reasons for this include: a rigid emphasis on traditional familial obligations including marriage, child-rearing and passing on the family lineage; negative portrayal by traditional media sources; and a long history of pathologizing gay people as being either “hooligans” or mentally ill — stigmatization that has facilitated a rise in faux marriages, social isolation and an HIV/AIDS public health crisis. My study found that youth scored roughly 32% more favorably than their parents in characterizing homosexuality as normal (2.38 to 3.15). Similarly, students were 34% more in favor of legalizing gay marriage in China than their parents (2.12 to 3.22). In regard to Chinese companies’ ability to refuse employment to gays on the sole basis of their sexual orientation, students were 19% more opposed than their parents (4.38 to 3.67). These trends seem to indicate a profound softening in attitudes towards the LGBT community. Moreover, post-survey interviews conducted suggested a “live and let live” attitude and a general acceptance that social impositions have been remarkably harsh toward sexual minorities and ought to be reassessed. I also found that students were 15% more accepting of having children with someone from a lower socioeconomic status (3.42 to 2.99). While this difference is palpable, it is certainly not as profound as other generation differences. When I broke down the analysis on the basis of gender, it appeared that female students were notably less approving than their male counterparts (17% less). This implies, of course, that there is a general expectation of men to provide for their wives and children. I was fascinated to find that, of all 20 indicators, the degrees of religiosity metric demonstrated the closest alignment. It might come as no surprise that China is one of the more irreligious countries in the world. In fact, according to a 2015 Gallup survey, it ranked at the bottom with nearly 90% of respondents claiming to be either not religious or atheist. While my results are consistent in this regard, students on average were only 5% less affirmative than their parents in response to “I consider myself a religious person” (3.97 to 3.77). Moreover, if a student reported a 5, they were very likely to report a 5 for their parents as well. In other words, the distribution was nearly identical between the two groups — indicating that the transmission of religion (or lack-thereof) is very resistant to change. One could hypothesize a variety of reasons why the transmission of some social values might be changing. As alluded to above, globalization has surely provided a degree of unprecedented interconnectedness that allows far-reaching communication and exploration. This, in addition to rapid urbanization, has exposed many Chinese to varying ethnicities, sexualities and socio-economic status. Additionally, international pressures to conform to Western notions of diversity and inclusion no doubt play a role. While I am cognizant of the tremendous challenges that remain, it is my hope that this exposure helps break down illusory prejudices and abstracted notions of “the other.” It is easy to fall into the trap of believing that social conditions are the way they are because of some objectively-correct reason, especially if we are not affected by the burdens imposed by these hierarchies. The growing interest in previously-stigmatized social issues among Chinese youth offers hope that just because something has been, doesn’t mean that it always must be.